The Mona Lisa ain’t got nothing on this Pizza! June 1, 2015 ~ Trevis Dampier Sr.
“Purely an Italian-American creation, like chicken Parmesan,” said John Mariani, a food writer and historian who has just published a book with the modest title: “How Italian Food Conquered the World.” “Peperoni” is the Italian word for large peppers, as in bell peppers, and there is no Italian salami called by that name, though some salamis from Calabria and Apulia are similarly spicy and flushed red with dried chilies. The first reference to pepperoni in print is from 1919, Mr. Mariani said, the period when pizzerias and Italian butcher shops began to flourish here. The pizza of your desires!! Boy Oh Boy do I love pizza!! If it weren’t for me trying to manage my weight then I would eat pizza for breakfast, lunch, dinner and in between! I love pizza when I’m sober.. I love pizza when I’m buzzed.. If I were hiking at the top of Mount Everest and needed a snack it would be pizza.. If I jumped out of a plane skydiving at 50,000 feet and needed a snack in the air; it would be pizza..
My last request on my death bed would be a hot slice of oozing cheese on a pepperoni pizza! If you have ever been to downtown San Jose, Ca then you may be familiar with the San Pedro Square Market. If not, then here is a place that you can visit next time you are in the Bay Area. It’s a great place to hangout and have a nice meal, adult beverages and music bands that entertain you all throughout the night. Highly recommended when you are looking for something to do during your binge moments during Happy Hour. 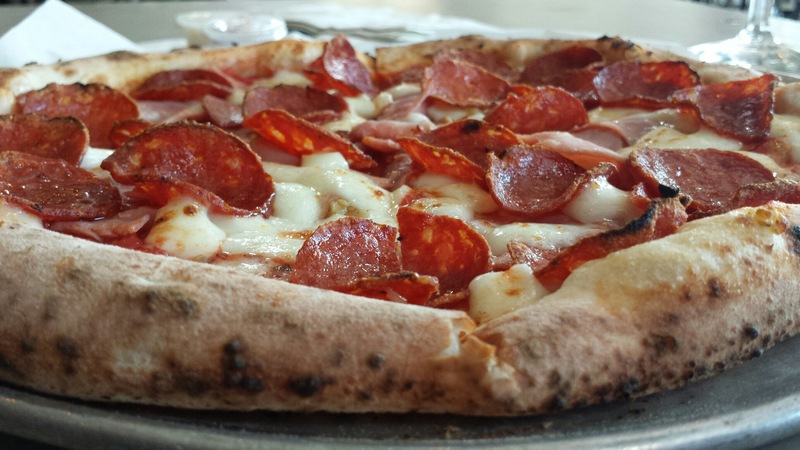 One of the restaurants located inside the San Pedro Market is Pizza Bocca Lupo. Their stamp on their food is their Neapolitan Wood Fired Thin Crust Pizzas and let me tell you that they are delicious! Today I ordered the Patrizio Pizza which contains Pepperoni, Prosciutto Cotto, Roasted Garlic, Oregano, Chili Flakes, Mozzarella,Parmagiano Reggiano, and Crushed San Marzano Tomato Sauce. I grab the medium pizza size platter and sit down in the lounge area ready to attack! I admired the thin crust and the beautiful elegance of its presentation and dove right in! While the crust is thin, it has a great crunch to it and the sauce is a masterpiece in itself… A great flavor with a slight tinge to it that sparks your palate like a fire cracker. The pepperoni has a great spice to it and meaty flavor that you wish there were double layers of it just engulfing the thing. The cheese was melted perfectly and didn’t overly consume the pizza but its cheesy flavorful blend complimented the pizza like a rose garden in the forest. True live action eating! Good job Pizza Bocca Lupo! < Previous Mama Mia! I want more MexCal Taqueria! Next > I’m singing ‘Hakuna Matata’ for this Chicken Enchilada!